Our NET Mr Wathen leads students to read aloud Mingpao’s Editorial once a week. The program aims to enrich students’ vocabulary skills and enhance their fluency in speaking. The school-based phonics has been introduced to facilitate students in developing letter recognition and formation and identifying syllables in words. 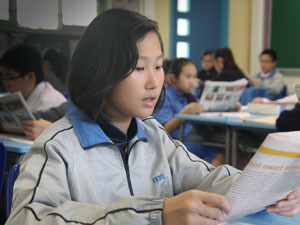 In addition to regular English Language lessons, English class periods are arranged in the afternoon to increase students’ exposure to English learning. Students’ reading, listening and writing skills can be better developed through diversified learning tasks and activities in order to lay a sound foundation in learning the language. English has been adopted as the medium of instruction (MOI) in teaching Science subjects. English learning elements are incorporated in some subjects as extended learning. Through the collaboration between English Language and non-English subject teachers, appropriate support measures are given to students to facilitate their English learning. We have been invited by the Education Bureau to share our teaching experience in implementing “Refined English Enhancement Scheme”. 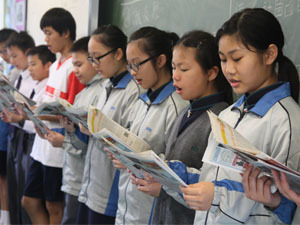 An array of English learning activities are provided to boost students’ interest in learning English, for example, drama appreciation, English reading ambassadors, FKYC ambassadors and reading carnivals. A print-rich English learning environment has been created to increase students’ exposure to English outside the classroom.